So wrote the painter Oskar Kokoschka about Alma, the young widow of the celebrated composer Gustav Mahler. 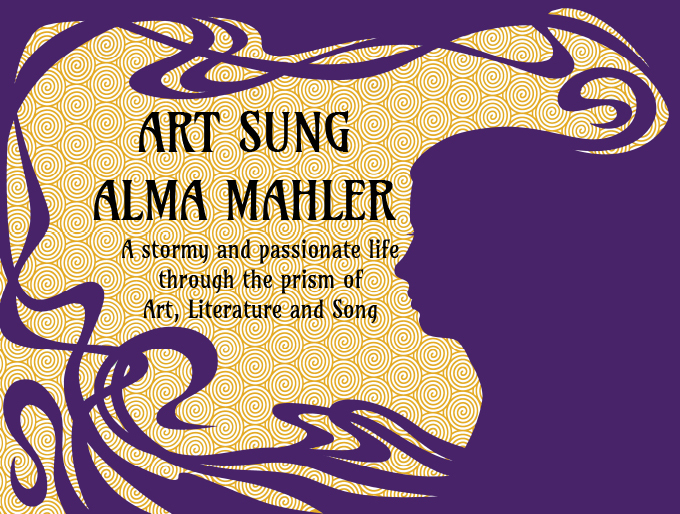 Her story is told in Art Sung – Alma Mahler, a dramatised recital combining the rich world of Lieder with a kaleidoscope of visual material from the Vienna Secession (Klimt, Kokoschka). Alma’s songs are at the heart of this recital, alongside music by Mahler, Zemlinsky, Wagner, Schumann and Beethoven. Readings from Alma’s diaries reveal a well-read, creative young woman living life to the full in glittering Vienna at the turn of the 20th century. We are plunged into Alma’s world of art, music, literature and fashion, not to mention the gossip about her many suitors, including the famous painter Gustav Klimt. It is her attraction to two men, Alexander von Zemlinsky and Gustav Mahler, which sets the scene for her own painful inner journey after giving up composing at Mahler’s insistence and the effect on their marriage.